Phil doesn't just go on one date with Rita, he goes on thousands of dates. During each date, he makes note of what she likes and responds to, and drops everything she doesn't. At the end he arrives at -- quite literally -- the perfect date. Everything that happens is the most ideal, most desirable version of all possible outcomes on that date on that particular day. Such are the luxuries afforded to a man repeating the same day forever. The next time you reach for A/B testing tools, remember what happened to Phil. You can achieve a shallow local maximum with A/B testing -- but you'll never win hearts and minds. If you, or anyone on your team, is still having trouble figuring that out, well, the solution is simple. BAGHDAD – The U.S. Defense Department is unable to properly account for over 95 percent of $9.1 billion in Iraqi oil money tapped by the U.S. for rebuilding the war ravaged nation, according to an audit released Tuesday. 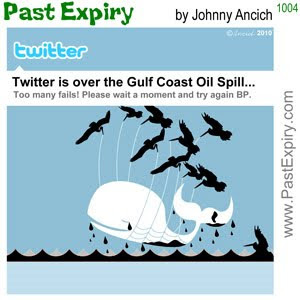 WASHINGTON – The federal government's oil spill chief said Tuesday that seepage two miles from BP's oil cap is coming from another well, tamping down fears that leaks mean the ruptured well is unstable. Plastic debris, mostly from US shores, floats in a great circle of currents north of Hawaii that is larger than the state of Texas. Ten years ago, samples showed that bits of plastic outnumbered plankton by six to one. Today it is over ten to one. Fish, birds, and marine mammals mistake plastic for food and die in the thousands every month. Disposable lighters and plastic bottle caps are among the most ubiquitous culprits. three photographs that have a strong repeat pattern, from the three striped aprons in the first shot; the graphic repeat of the outstretched arms in the second shot, and the pandas ad infinitum in the third. It is a technique that Margaret Bourk-White used many times, as in this Life magazine cover of the Hoover Dam. Someone who has never seen a dam might still not know what one looks like from seeing this photo, but they will know that dams are big and powerful. THE HAGUE (AFP) – The International Criminal Court has suspended Congolese militia chief Thomas Lubanga’s trial and rapped prosecutors for abusing court processes and ignoring judges’ orders. “The prosecutor has elected to act unilaterally in the present circumstances and he declines to be ‘checked’ by the (trial) chamber,” said Thursday’s judgment suspending Lubanga’s trail which started in January 2009. Issue:FriendFeed subscriber counts have not been reported since 10-Jul. We are in contact with FriendFeed to help resolve this issue. While publishers will a notice corresponding drop in their subscriber counts this is a reporting problem only and in no way affects feed delivery. I see it works, because I autoposted from Posterous to PixelsAteMyHomework, so unless this post came here from Amplify of its own accord via an underground tunnel known only to the computers-will-work-any-way-they-want method, then this came down the intended route. ...So I decided to take the photograph. The light was low and the shot was never going to be a good one. Still, I propped my camera tight against my body and took the shot. Another time we might have stopped to look at the stalls and maybe exchanged a smile with the people standing there. This time we walked on the metro – it was getting late and we had a long journey to make to the other side of Delhi at Majnu KaTila, but that’s another story. Now though, looking at this ‘not very good’ shot, I am transported back to the warm evening, the sounds, the sense of being there. That is why I take a camera. According to the National Trust, Puffin numbers on the Farne islands increased five per cent last year and increased five percent this year. This follows a precipitous decline in 2008 when the number of breeding pairs dropped from 55,000 to 36,500. That crash in numbers was attributed to a decline in the sand eels upon which puffins feed. The decline in sand eels was blamed on the changing climate because sand eels have a narrow range of sea temperatures within which they can thrive. The Farne Islands are off the Northumberland coast of England and the largest concentration of puffins in England breed there. So why the increase in population? On Thursday May 20, 2010 The official site of the Prime Minister’s Office set out the Conservative-Liberal Democrat coalition Government’s programme for government. The site in turn refers to the Cabinet Office website where the full statement can be found. There are 31 sections over 36 pages, covering topics from banking to schools, from defence to taxation. Section 11 covers environment, food, and rural affairs, perhaps because they did not each merit a section of their own or perhaps because they are so inter-related that they were best dealt with under one heading. In fact, the topics are in conflict. What is good for the rural economy is not always good for wildlife. As with the other sections of the document, section 11 begins with a general statement of belief followed by the individual statements of the Governments intentions. I want to highlight just two of the 18 statements of intent. We will introduce measures to protect wildlife and promote green spaces and wildlife corridors in order to halt the loss of habitats and restore biodiversity. We will bring forward a motion on a free vote enabling the House of Commons to express its view on the repeal of the Hunting Act. The Hunting Act 2004 came into force on February 18, 2005. According the League Against Cruel Sports – a charity that has been operating since 1924, there have been 140 convictions for offences under the Act since it was introduced, with 33 convictions in 2008. There was strong opposition to the Act from a vocal minority who supported local hunts. There was a huge voice from right across Britain in favour of a ban on fox hunting by dogs who would chase down and rip a fox apart for sport. So why on earth has the Government stated that it is committed to letting MPs vote according to their conscience on whether to repeal an Act of Parliament that was voted on and passed just five years ago? Critics of the Conservatives would say it is because the heart and soul of the Conservative party are the landed gentry who still believe in a divine right to rule and the right to carry on in their own backyard as they wish. Critics would say it is because the landed gentry are living the dream of hunting with the kings of the early middle ages in the hunting preserves. Others looking at it from the other side might say it is because the Government wants to silence the pro-hunting lobby once and for all, and a free vote will do that because ‘everyone’ knows the majority of MPs will oppose the repeal of the legislation. Well we don’t have to analyse it. We just have to recognise that whatever the motivation behind introducing a free vote – people need to make their voices heard. Speak loudly and insistently and people who can change things will listen. So tell your MP. If you want a simple pro-forma letter you can send to your local MP, here it is. You can find your MP’s contact details here at the They Work For You website. The coalition government has published its intention to bring forward a motion on a free vote enabling the House of Commons to express its view on the repeal of the Hunting Act 2004. I wish to register with you my opposition to the repeal of this legislation. The European Court of Human Rights has rejected the United Kingdom’s application to appeal its decision in a recent finding that stop and search powers enacted as part of anti-terrorism legislation breached human rights law. In January 2010 the European Court held that section 44 of the Terrorism Act 2000 (the broad police power to stop and search without suspicion) violates the right to respect for private life guaranteed by Article 8 of the Convention on Human Rights (Gillan and Quinton v. UK 4158/05  ECHR 28 (12 January 2010)). The claimants received £500 each by way of compensation. Is this coincidence? Is there something awry with my machine? I can see this 'problem' of the type being in BOLD in the article and it is showing up in Safari 5 and in Firefox. Just these two sites, all other sites are OK.